Originally released in 1973, the double album ‘Goodbye Yellow Brick Road’ is one of the great albums in the Rock’n’Roll history. 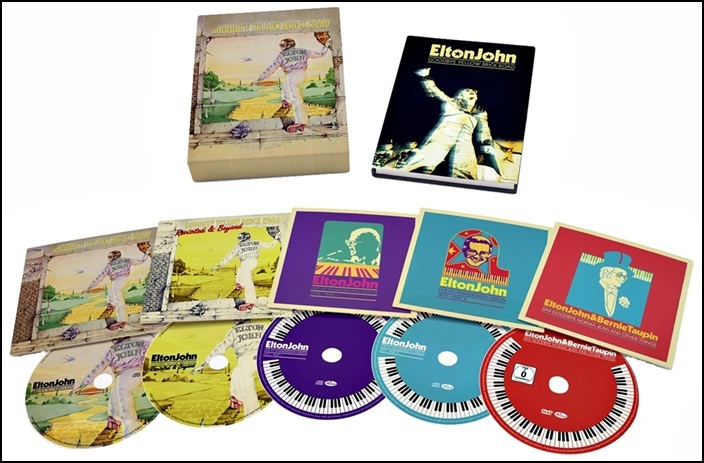 The new 40th anniversary limited edition box set comes as 4 CD / 1 DVD box set with a hardback book, the original recordings, a previously unavailable and the legendary concert at the London Hammersmith Odeon and new cover versions by Ed Sheeran, Emeli Sandé, Fall Out Boy, Hunter Hayes, Imedla May, John Grant, Miguel featuring Wale, The Band Perry and Zac Brown Band. Ed SheeranElton JohnEmeli SandéFall Out BoyGoodbye Yellow Brick RoadHunter HayesImedla MayJohn GrantLondon Hammersmith OdeonMiguel featuring WaleThe Band PerryZac Brown Band.